The Ministry of Global Peace has been first researched and developed by the Global Community ever since 1985. Global Peace Day celebration on May 26 of each year. Life Day celebration also on May 26 of each year. 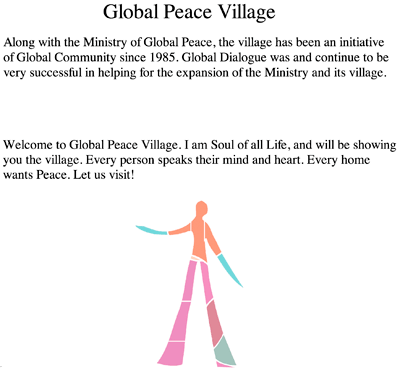 In preparation of Global Peace Day celebration this year, I thought giving the Ministry of Global Peace website a different look in step with the needs of people from all nations of the world. First let say a few words about what should be done concerning those needs. It is very much about the Glass Bubble concept of "a Global Community". The Glass Bubble is designed to illustrate the concept of "a global community" to elementary school children as opposed to the idea a community is "the street where I live." It is an imaginary space enclosed in a glass bubble. Inside this is everything the child can see: above to the clouds, below into the waters of a lake or in the earth, to the horizons in front, in back, and on the sides. Every creature, every plant, every person, every structure that is visible to him(her) is part of this "global community." By focusing on familiar ground in this manner it can be taught that every living thing within the glass bubble is there because his/her food is there, his/her home is there, all he/she needs to survive is there. And every creature will stay as long as what his/her needs remains to be available within that "global community." Look up, look down, to the right, to the left, in front and behind you. Imagine all this space is inside a giant clear glass bubble. This is "a global community." Wherever you go, you are inside a "global" community. Every thing, every living creature there, interacts one upon the other. Influences inter-weave and are responsible for causes and effects. Worlds within worlds orbiting in and out of one another's space, having their being. Your presence has influence on everything else inside your immediate global community. Learn to be aware of that and act accordingly, to create good or destroy, to help or to hurt. Your choice. Now let us explore this Global Community that we have visited and discover why each member is important ~ each bird, each tree, each little animal, each insect, plant and human being ~ and how all work together to create a good place to live. You walk like a giant in this Global Community. To all the tiny members you are so big, so powerful, even scary… You can make or break their world. But by knowing their needs, and taking care, you can help your whole Global Community be a good one. What bothers you about it? Anything need to be done? What is really good there? What is very very important? What is not so important? What is needed to keep the good things? What could make them even better? What could you do to keep the good things good? Could they help get rid of bad things? What unimportant things need to go? How could you help get rid of these things? Let each child be aware he or she either grows up to be a person who helps or a person who destroys. Each child makes his or her own choice. He creates his own future in this way. He becomes a responsible citizen by chosing to be a person who helps. This may or may not inspire some sort of creative project of what "could be" to aid this Global Community to remain healthy. 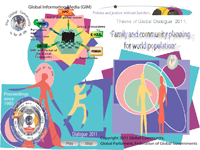 The concept of the Glass Bubble can be extended to include planet Earth and all the "global communities" contained therein we called the Global Community. This Glass Bubble concept is also about Peace and how to achieve a world at Peace. Because we do have to make a list of our needs for survival on the planet and make sure that those needs are in harmony with the natural environment and the people from all nations. But there are too many needs and some are not as important as others. So how do we prioritize our list of needs so as to achieve Peace amongst us all? We know everything is related. All aspects of 'modern life' are related to one another. Gradually, over the past decades, this global concept leads to the research and development of the Scale of Global Rights and to the Ministry of Global Peace. The Scale prioritizes all aspects for us. The Scale tells us what is most important for our survival on the planet. It also tells us what is least important. That is very much in tune with the Glass Bubble concept but now we can make a priority list for our survival and the protection of all life on our planet. This is when the Scale becomes a useful tool. A reminder of her passing away. Virginie was a great global citizen, and we all owe her something that's forever. Life Day Celebration	on May 26. Participate. 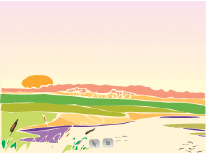 This animation is concerned about explaining some aspects about the theme of this year Global Dialogue. Authors of research papers and articles on issues of Global Peace. Ammar Banni (2), Maude Barlow, Thierry Bécourt (2), Mirza A. Beg, Phyllis Bennis, Monika Berghoff, M K Bhadrakumar, Michael Boldin, Madeleine Bunting, MARIE DAVID C., Fidel Castro, Guy CREQUIE, CODEPINK: (Dana, Farida, Gael, Gayle, Janet, Jodie, Medea, Nancy, Paris, Rae, Suzanne, and Whitney), Most Honorable Bilongo Bolo Serge Christian (2), Radha D'Souza, Germain Dufour, Dr Michael Ellis, S. Faizi, Freedom Socialist Party, Martine Gilhard, Peter Gleick, Andrew Glikson, Global Footprint Network, Nina Goncharova, Mikhail Gorbachev, Jacques L. Hamel, Steve Hochstadt, Indegenous Peoples' Declaration, Chalmers Johnson, Mariam Khan, Tara Lohan, Mary Hamer M.D., Dot Maver, Dr. Charles Mercieca, Leslaw Michnowski (2), Jason Miller, Dr. Matjaz MULEJ, Verlag Meiga, Madeline Ostrander, Pablo Ouziel (3), Gideon Polya, Dr. Leo Rebello, Mme Marie Robert, Kamala Sarup, Dr. Leo Semashko, Cindy Sheehan, Vandana Shiva, Mme Gabrielle SIMOND, Soul of all Life, Soul of Humanity's Message, David Sparenberg, David Allen Stringer, David Swanson, Scott Thill, Archbishop Desmond Tutu (2), Manuel Valenzuela, Dr. José G. Vargas-Hernández, John Vidal, Rene Wadlow, John Waldman (2), Rev.Dr.Awoa Allo Paul Yannick, Kourosh Ziabari.